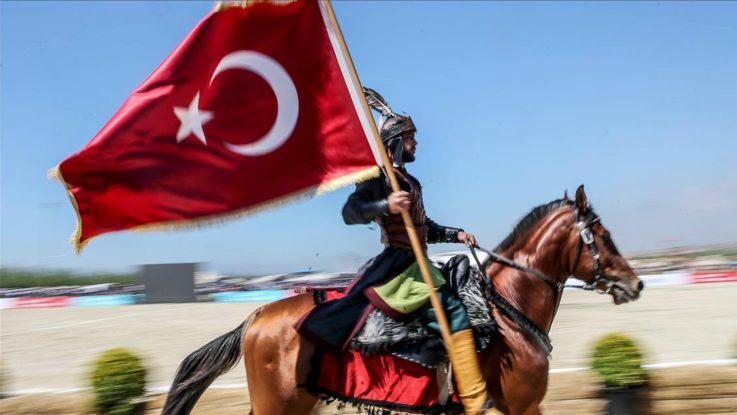 A festival spotlighting Turkic sports and cultures from legendary ages past began in Istanbul on Thursday. The second annual Ethnosports Culture Festival, sponsored by Anadolu Agency, aims to promote and revive sports and cultures unique to ancient Turkic life. Hakan Kazanci, deputy chairman of the World Ethnosports Federation, told Anadolu Agency, “We aim to bring to light sports which are in our blood.” He said the four-day event hopes to introduce sports internationally while making the festival an Olympic-like event. “We will comfortably welcome one million visitors this year,” Kazanci stated, adding that they changed the festival venue in light of the huge number of visitors they attracted last year. The activities are taking place at the Yenikapi meeting area in Istanbul’s Fatih district — also known as a historical peninsula — within easy reach of public transportation. Yasin Tutuncu, the festival’s art director, called it “an exceptional organization” in terms of content and atmosphere. “A special feature of the event is that the cultural activities and sports can be experienced by the visitors. That’s why our festival is really unusual,” he said. Tutuncu added that they placed 42 tents in an open field as they “want people to open up this treasure” as some of the tents come from nomadic and Central Asian cultures. A total of 843 athletes are competing in 11 different sport categories. Featured events include mounted archery, horse riding, oil wrestling, traditional Turkic and Central Asian sports, and folk music concerts. A group of traditional Turkic tents will also be displayed during the festival. In oil wrestling, nearly 300 athletes will be grappling their way to glory. The festival also includes 30 artists from various traditional art forms with a shrinking number of practitioners. For children, 26 plays will be staged. The festival runs through May 14.